I currently use three different setups for astrophotography. Which one I setup on any given night really depends on my goals and imaging targets for that evening. Also be sure to see the recommended accessories. 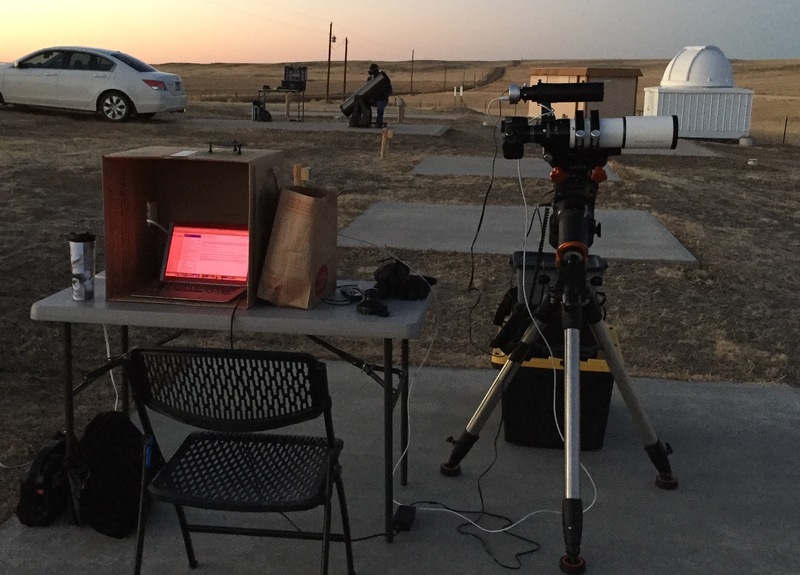 Deep Sky Imaging Setup: The cardboard box makes a good dew cover and light shield for the laptop, which controls and camera and auto-guider. This is pretty similar to the setup I started with 3 years ago, but I’ve managed to upgrade every single major component over that time. This is what I use for planets, deep space objects with a small angular size, and the occasional lunar image. 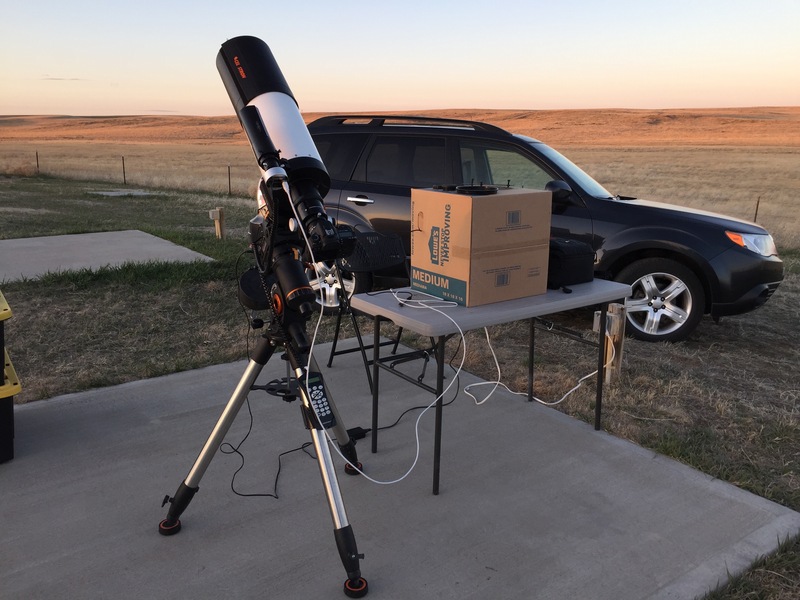 This is a bulky carload of a setup, but I have used it pretty regularly at the Denver Astronomical Society’s Dark Sky Site that’s about a 70 minute drive away from me. However, I also think this is about the heaviest setup I’m likely to get. It’s about the right balance for me of portability and capability. I’ve also found that a pair of those 27-gallon plastic tubs work great with some foam lining for transporting the mount in one box and the telescope in the other. 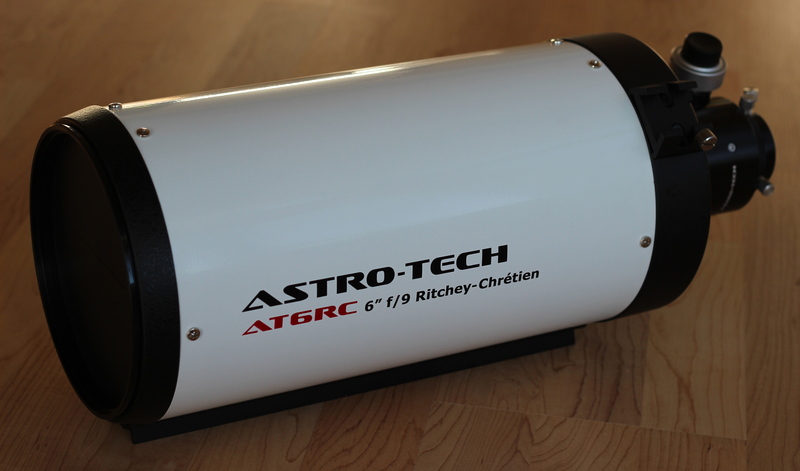 I’m convinced that the 6″ Ritchey-Chrétien is the bargain of the decade for astrophotography. Astro-Tech is the cheapest at $400, but they are frequently wait-listed. Orion Telescopes has recently begun offering the same Ritchey-Chrétien scopes in 3 sizes: 6″ RC, 8″ RC, and 10″ RC. These appear to be identical to those offered by Astro-Tech, which are also branded elsewhere as GSO. Each retailer seems to offer a slightly different package, but the same scope and focuser. The Orion scopes quite handily include dual-finder scope shoes, so you can use one for an auto guider and the other for a visual finder. Regardless of the brand label, these are very good imaging scopes! OK, twist my arm, and I might upgrade to an 8″ RC optical tube at some point. 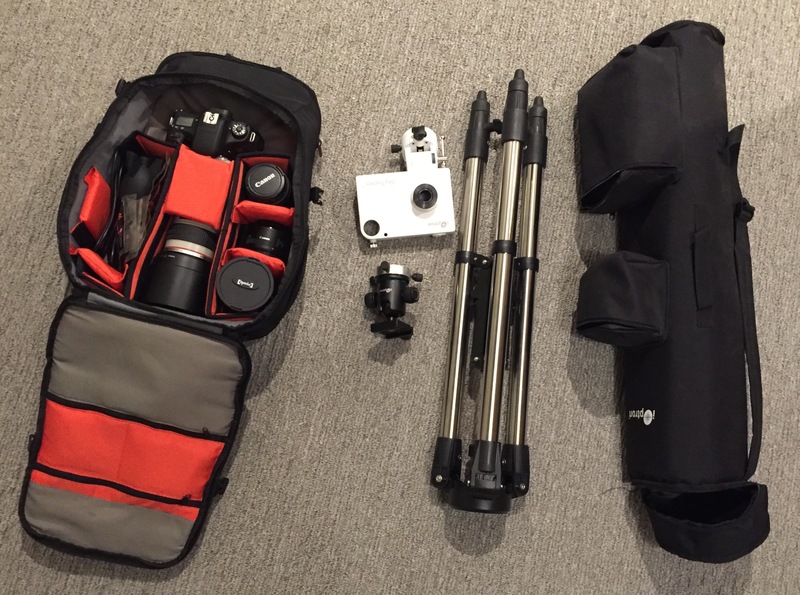 Portable Setup: Everything fits nicely in a backpack and a carry bag. This is a pretty versatile setup, a true grab and go rig with no heavy counterweights, external batteries, or laptop required. With a careful polar alignment and a delicate touch, I can manage 5 minute exposures at 100mm with this setup, very useful for subjects like the Rho Nebula complex. This all gets packed in a backpack and a carry case and weighs less than 20 lbs. Easy to transport and setup. This is my future road-trip imaging package. There are a lot of interesting things to photograph that sit right in the middle of what I can image with those two other setups. An 80MM APO refractor fills that gap nicely. Add an inexpensive solar filter, and it also becomes a white-light solar scope! Most of the same accessories as the Deep Space setup. This page is a mostly complete list of the astronomy and photography equipment that I use for the astrophotography posted in the Gallery. In cases where there are newer alternatives available to the equipment I have, I’ve listed those alternatives as well. To date, I’ve spent around $5,000 including the cameras, telescopes and mounts (yes, all of those are plural), and all the other little accessories. You can definitely spend less, or a heck of a lot more. If you already have a camera and a telescope, the investment may be well under $100 for a few simple adapters. If you have questions, please leave a comment below, or contact me and I’ll be happy to try to help. I started out with a refurbished Canon T3i. I’ve since upgraded to both a Canon T6s, and a Canon 7D Mark II. Honestly, if you have a DSLR, you can use it for astrophotography. If you are looking at getting a new DSLR with astrophotography in mine, see the post The Best DSLR Cameras for Astrophotography. A final small but notable addition would be a Bahtinov Mask. This is a really simple focusing mask you just place over the objective of the telescope while pointing at a bright star, and it shows you a set of three diffraction spikes, two of which form an X, the middle of which shifts position with the focus. When you get that middle spike dead center between the X, you know your focus is bang-on. What I found is that LiveView will get me close, but the mask takes care of that last mm or so of adjustment for perfect focus. You can buy a Bahtinov mask for about $20, which I think it totally worth it. Alternatively, here are instructions on how to make your own. Any telescope mount with tracking or goto capabilities is going to need power. Some scopes have internal battery compartments, while the one I picked requires external power. I’ve used an AC adapter, but also purchased a Celestron Power Tank for portability. I don’t consider this a perfect solution, but it’s a relatively inexpensive option, and has had no problem powering the mount for 4 hours (which is the longest stretch I’ve been out for). For camera power, be sure to have at least one extra battery. Particularly in cold weather, camera batteries drain quickly. The Canon T6s seems to actually have much better power management for long exposures than other cameras I’ve tried – I’ve imaged for 4 hours on a single charge, which is double what I’ve gotten from my other two cameras. Still, I carry a spare battery for it. To connect the camera to the telescope requires two small adapters. First is a Celestron T-Ring for EOS Digital Cameras that clips into the body of the camera in place of the lens. Second is a Celestron T-Adapter for SCT Telescopes . This provides the bridge between the T-Ring and the back of the telescope to let you connect the camera in prime focus. An alternative that I also find useful is the Celestron Universal 1.25-inch Camera T-Adapter . This lets you slide the camera into a standard 1 1/4″ visual back, making it usable with almost any telescope. This also allows you to use standard barlow lenses and filters, which are handy for photographing planets or distant nebula. Most of my photos of Jupiter use this adapter along with a High Point Scientific 2.5x Barlow. The drawback of the 1 1/4″ adapter vs the SCT adapter is that you do get some vignetting around the edges of the image, whereas you won’t with the SCT adapter, since it has a wider internal diameter. If you have a telescope that will accept a 2″ eyepiece, then you can also find 2″ T-Adapters. The other attachment method is to use a Celestron Piggyback Mount to have the camera with a standard lens ride on top of the telescope. This enables wide field photography to capture whole constellations while taking advantage of the tracking capabilities of the telescope mount. When doing wide field imaging, tracking doesn’t need to be nearly as accurate, so this can be a good way to start out. To take longer exposure photos, you will want an Intervalometer Remote Shutter Control . This lets you set the camera for exposures longer than 30 seconds (up to hours if you wish) and also lets you avoid touching the camera to trigger the shutter, since that can lead to camera shake that will be visible in the photo. Another useful extra are Vibration Suppression Pads that will help to dampen the knocks and bumps, as well as just your foot steps around the telescope. The last accessories worth mentioning are the Telescope Lens Hood and Camera Lens Hood . These are inexpensive, and are a real benefit in preventing both stray light and reducing dew on the lens. 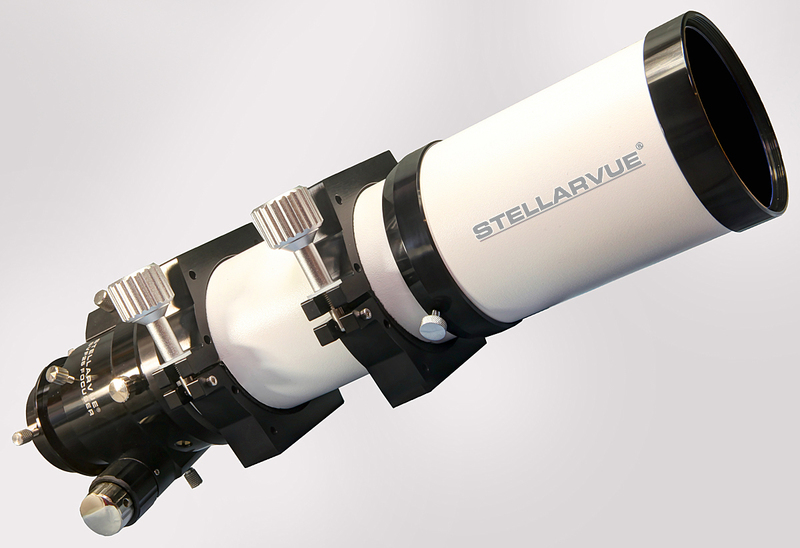 This is one of the most highly regarded 80mm Apochromatic refractors on the market. Very high quality focuser, good quality case, and an available dedicated 0.8x field flattener/reducer making this a prime choice for wide-field astrophotography. The scope is native f/6 for a 480mm focal length. Adding the reducer results in an f/4.8 384mm imaging scope, ideal for objects like the Orion Nebula or Andromeda when paired with a DSLR camera. This is the first telescope I purchased, and I still use it all the time for public outreach and planetary viewing. Makes an excellent visual scope, and includes a finder, 1 1/4″ diagonal, and a 24mm eyepiece. If you are looking to get started in Astrophotography though, I recommend an 80mm APO Refractor instead. This scope is the bargain of the astrophotography world. At under $500, you get an astrograph using the same basic optical setup as many professional class observatories (including Hubble) in a small and portable package. I do recommend starting out with a wide-field scope like an 80mm refractor. Once you get some experience in astrophotography, and have a good equatorial mount and auto guider, the Ritchey-Chrétien astrographs are the line of scopes to look at for long focal length imaging. The 7D Mark II represents the high end of Canon’s APS-C sized sensor camera line. Introduced in late 2014, it includes the latest DIGIC 6 processor (actually 2 of them) a study magnesium body, and a 20Mp sensor that represents the best APS-C sensor to date from Canon. Introduced at $1799, Canon has recently dropped the MSRP to $1499. You can sometimes find grey market cameras (new, but not backed by the Canon USA warranty) for as low as $1199 on eBay. Check the Deals on Gear page for special pricing that may be available. The T6s is the newest camera in Canon’s entry level Rebel line of DSLRs. The T6s moves slightly up market with the addition of a top-mounted LCD similar to the higher end 70D and 7D models. It’s still a smaller body however, and includes the very useful articulating touch-screen LCD. It’s also the first new Rebel in several years to introduce a new 24Mp sensor. This is the camera I started doing astrophotography with. It’s still a very capable camera, and in wide use in the astrophotography community. Unfortunately you can’t buy them new anymore. You can occasionally find refurbished units on Canon’s online store, or used models on eBay. If you want an inexpensive entry into DSLRs, the T3i, T4i, or T5i are excellent options. While I don’t own this particular model, it’s the closest match you can still buy new to the T3i, and appears to have slightly lower thermal noise. This model is a couple years old now, but can be purchased with a basic lens kit for under $650 new. The iOptron Skytracker with Polar scope is a great option if you want to dip a toe into astrophotography and already have a camera, tripod, and some lenses. Also a great light weight travel option. I recently bought one of these, and so far have a positive impression. With the price at only $299, this makes for an ultra-portable, easy to travel with astrophotography mount. It can also be purchased as a complete kit with a tripod and ball head for mounting the camera for $449. NOTE: There is a new version called the SkyTracker Pro, which actually addresses a number of complaints I’ve had about the original Skytracker. The best part is, it’s the same price as the previous model! I had for a while used a Celestron CGEM mount, but eventually sold it. Celestron just at the end of 2016 introduced a new mount, the CGX, which looks like a very worthy successor to the CGEM. The CG5 was Celestron’s entry level equatorial mount that got me started in astrophotography (with some degree of frustration). So, while it isn’t the best mount for imaging, it works great as a visual mount. I still use this regularly for public outreach events with the C6 SCT or the Stellarvue 80mm. Much lighter and more portable than the CGEM. The CGX is the new mount from Celestron that looks to be a great replacement for the aging CGEM. 34 Responses to "Astrophotography Gear"
I want to learn astrophotography and start reading your website today. I have questions about the gears. Is Stellarvue 80mm telescope can be replaced with Sigma lens 50-500mm or Sigma 150-600mm? So we don’ have to buy telescop camera adapter, focusing, power, Is the results would be the same? I mean the result of the photo / image quality. Can we see/photograph deep sky with the lens or have to only wiith telescope. Hi Nelly, sure you can absolutely use a long focal length camera lens. I have a canon 70-200 I use for wider field imaging. The caution with most camera lenses is they tend to have a lot of optical elements, and if they aren’t very well made, you will see distorted areas in the images. I’ve come to realize that astrophotography is one of the hardest tests for a lens in terms of sharpness and consistency. That said, just realize it probably won’t be perfect, but more than good enough to get started with. Even the best camera lenses tend to introduce chromatic aberration, fortunately this is very easy to fix in Lightroom and other photo software. Also, auto-focus is useless for astrophotography. You still need to focus manually. The main thing then is the mount. Regardless of a telescope or camera lens, you need a good mount that can track the sky. Hope that’s helpful! Ok, thanks a lot for your reply. I think I will buy the gears as you recommend for astrophotography because i will photograph planet and deep space objects. Will buy telescope instead of lens. Now i have canon 70D, Canon EF 50mm f/1.8 II, Canon 18-200 mm f/3.5-5.6 IS ( will buy 70-200mm later) for wider field imaging. To be clear, you can buy less expensive scopes too than the Stellarvue. Explore Scientific has some good ones on sale at the moment. And no reason to get a 70-200 if you already have a 18-200 if it works well. Start out with the lenses you have, get some practice, and expand your gear from there! You mentioned you were going to do a review of the T6s. How do you enjoy your T6s, and then are you satisfied with it’s use in astrophotography? Hi Chris, In short, yes, I like the T6s for AP. I actually find the batteries last twice as long as the ones in the 7DII, even though the batteries for the T6s are smaller. My guess is better power management in the T6s during long exposures. I’d say subjectively quality is comparable between the two cameras, and both have much lower thermal noise than the T3i I used before. Unfortunately, I haven’t gotten a lot of opportunities for imaging lately to present a thorough review. Ok, thanks for your reply. I’m looking at buying one in the next couple of days. Hi Aadhi, The T6s is a newer camera with a higher MP sensor and appears to have better thermal characteristics. So, it’s a good camera. So is the T5i/700d. (At this point, I use both a T6s and a 7D mark II regularly after starting out 3 years ago with a T3i.) It really depends on your budget and how particular you are about your pictures. If you just want to get started in astrophotography, getting a camera that’s a year or two old will save you a good chunk of cash, and the difference in quality will be minimal. If you also want a good DSLR for other uses, maybe it’s worth it to you to invest a little more money in it. The more critical elements to a great astrophoto are going to be your other equipment – the lens or telescope, the mount, and post-processing skills and software. I realize that isn’t a direct answer to your question, but there is no one right answer for everyone. Thank you so much for your inputs ,will be purchasing the Canon EOS Rebel T6s camera for my telescope.Thank you Once again .you are right about the other equipment.I do have a Celestron Nexstar se 8, with equatorial mount. i will have to get a wedge too..Thanks again with the info. The Canon EOS Rebel T6s camera is not available in India the closest which comes to it is 760D.Is it okay?? Exactly the same model. For some reason, Canon calls it the T6s in the US and the 760D in other countries. Great article, I have a Meade ETX-ET 125, Canon T2i, bought the T-Adapter and T-ring. When i look at a distant object say moon using the eye piece of the telescope, and now I replace the eye piece with the T2i, the image is out of focus. I then have to use the live view to look at the blurred object and then achieve focus. I guess now i have to tweak the focus to get it focussed on the sensor. This works in case of moon, but if its a star, its difficult to see the object in live view and achieve focus. Also since I removed the lens i cannot control the aperture, so the image is always not really sharp. Can you please share your thoughts and experience on this kind of problems ? Do i need to get a special eye piece just for camera ? The focuser setting is going to be different between the eyepiece and the camera, just as you saw. The season is the back-focus point is different between the camera sensor and the eyepiece. That is normal. Live view works great for focusing on the moon or bright stars. It helps to up the ISO to 1600 and the exposure to manual, set to several seconds up to 30 seconds. That will get brighter stars visible in Live View. Aperture is fixed with the aperture and focal ratio of the telescope. You should be able to achieve a sharp image using the live view, and if the camera supports it, the 10x zoom in live view once you center on a bright star. I also find a Bahtinov mask extremely helpful to really refine the focus, just search google for them, they are only around $20-30. Thank you for the helpful tips. I will try to get the Bahtinov mask and see how to achieve focus. Since i don’t have an eye piece, should i get a barlow lens so it can focus the image properly on the sensor ? Right now its just hollow tube between the scope and the sensor. So focusing on the sensor is very difficult. Any thoughts on that ? Thank you Sorin for the link to the adapter, I will check that out and see if it helps in achieving focus. Interesting article with some very good information! I’m curious about how to connect a camera to the telescope and a Barlow lens. I’ve got a CGEM 8″ Edge HD SCT with 0.7 reducer, Celestron T ring and adapter and a Canon 60D. Not sure where the Barlow would go or what type to purchase to photograph planets like Saturn and Jupiter. Any ideas or do you have a photograph of the back end of your telescope? I’m guessing you have a t-adapter that screws into the back of the SCT replacing the visual back where the diagonal would go. You can get a different type of t-adapter (like this one) that fits into the regular 1 1/4″ visual back, and you can then put the barlow in. So, use the normal visual back on the telescope -> Barlow -> 1 1/4″ T-adaptor -> T-ring -> Camera. For planets and using a barlow, you’d also of course want to remove the reducer, since the goal for planets is more focal length. Oh, and there is also a T-adaptor that includes a 2x barlow by Celestron. In my own case, I use the High Point Scientific 2.5x Barlow and have been happy with it for photography and visual use. I think this will work well but might have to install the camera vertically on a diagonal because of the weight? I’m wondering if the set screw will be strong enough to hold the camera if used in-line with the telescope. Hello, I’m new to DSLR cameras and photography, and I’m very interested in photographing Jupiter, Saturn, and the Milky Way. I own a Nikon D3200, and I plan on buying a Celestron NexStar 130 SLT Computerized Telescope (plus mounting accessories) in order to capture planets and other objects–I hear that this telescope can capture distance galaxies as well. I would love to photograph galaxies too. My question is: What do you recommend in terms of manual camera settings for Jupiter, Saturn, and distant galaxies when used in conjunction with this telescope–things like shutter speed, aperture, ISO etc.? Should I use stacking software for better results? Thanks! Most dslr cameras have a bulb function, allowing you to keep the shutter open as long as you’d like. YES THE CANON TP 5 CAN YOU LEAVE THE SHUTTER OPEN FOR SAY 30 TO 40 SECONDS? REASON I ASK IS I DON’T OWN A TELESCOPE YET AND WANT TO TAKE PICS OF CONSTELLATIONS AND OTHER SKY STUFF BUT ONLY WITH A CAMERA THAT CAN KEEP THE SHUTTER OPEN, IF YOU KNOW WHAT I MEAN. THESE CAMERAS SOLD FOR 549.00 ON QVC WITH FREE SHIPPING NOT BAD I GUESS I HAVE HEARD HOW GOOD THE CANON T3I IS AND WAS JUST CURIOUS. I believe so, but you should check the specs on Canon’s website to verify. Generally DSLRs will allow you do up to 30 second exposures, then require an intervalometer for longer. And as good netiquette, please don’t typing in all caps. Thanks. If you mean the Canon T5, it is the replacement for the older T3. The main difference you’ll see vs a T3i is the T5 doesn’t have the rotating LCD screen, which i’ve found to be extremely useful. In most other respects, I believe they are pretty similar. Incidentally, you can find that price for a T5 bundle on Amazon and probably other places as well.